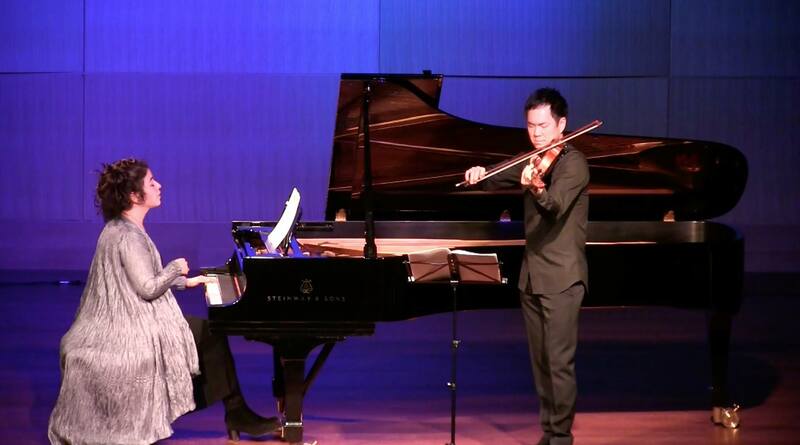 Camerata Pacifica‘s April concert was a juxtaposition of two contrasting works: the world premiere of Lera Auerbach‘s 24 Preludes for Viola and Piano (“Wanderer”), a Camerata Pacifica commission; and the Piano Trio in B-flat Major by Schubert. Both were roughly 45-minutes in length, but similarities ended there. Opening the concert was Ms. Auerbach’s new work. It is a collection of one- to four-minute preludes, each in a different one of the 12 major and minor keys, presented sequentially so that the first two movements featured no accidentals (C major, then A minor), then adding more sharps one by one (G major through D-sharp minor), and continuing around the circle of fifths before ultimately getting back down to a single flat in F major and D minor. The composer mentioned from the stage that she began composing the preludes during stops between cities as she drove across Europe, part of her other life as a visual artist. She later added “Wanderer” as a title for the collection after realizing that the sketches she made for each of the preludes were written in a different city. As such, each work has its own subtitle based on the name of its respective place of origin: for example, “Prelude 1. C major Andante misterioso (The Alps),” or “Prelude 6. B minor Tragico (Copenhagen). ” She also clarified that individual movements represented more of an abstract memory of each respective locale and her activities there rather than any tone painting or attempt to evoke specific imagery. Given this origin, the completed collection across all of its 24 movements is, not surprisingly, a study in recollection and introspection. Individual preludes shift in mood from pensive to agitated, one restless and another calm. At the same time, certain gestures and themes are echoed throughout the cycle. There is a pervasive sense of constant thinking and doing, of process, motion, and struggle, so that even the slower and quieter moments are imbued with anticipation. The music is packed with melancholy and mischief unencumbered by any overt joy. These preludes are often cloudy, sometimes nocturnal, occasionally stormy, with the bright warmth of the sun nowhere to be found. That’s not to say that this music doesn’t have its beautiful moments. The night can have as much appeal as the day, and so it is here. These preludes are dark but not depressing, never wallowing in any morbid or goth-tinged “Every Day is Halloween” sensibility. Moreover, Ms. Auerbach’s compositional style is contemporary yet direct, with melody and harmony being clearly delineated. Technical hurdles she imposes on the viola soloist are substantial but conventional: long lines give way to lightning-fast passages and big jumps, with pizzicato, sul ponticello, and sul tasto playing mixed in; absent are any modernist tricks like preparing the viola with extraneous parts, replacing the bow with a glass rod, or having the soloist sing into the instrument. At the same time, she finds a plethora of ways to communicate emotion in her phrasing, dynamics, and melodic development without ever pandering to listeners with any kind of neo-Romantic gestures. It would be hard to imagine a more persuasive soloist for this new work than violist Richard O’Neill. He gave a virtuosic performance, combining a ravishing tone with pinpoint accuracy, rich variety of timbres, and impressive technical chops. Mr. O’Neill is said to have thought of the cycle initially as a collection of independent works, bringing to mind that more famous traversal of the 24 major and minor keys, The Well-Tempered Clavier by Bach; however, after studying these new preludes more, his analogy shifted to a different 24-part masterpiece — Schubert’s Wintereisse — so that his approach to the individual pieces became more like sections of a greater whole. It showed. Every individual prelude was given its own character, yet the threads weaving them together were clearly evident. Ms. Auerbach herself served as the pianist, providing sensitive support in what was a secondary role, with the composer deferring to her soloist at all times. Even in preludes where the piano opens the proceedings, it felt more like an extended introduction rather than a change in protagonists. This works and is clearly what the composer intended, though it’d be interesting to see how another duo might approach the rapport between the instruments differently. Regardless of who plays it, this collection of preludes deserve repeated performances and hearings. While it might not break any new ground, the preludes are musically interesting and tasteful, with enough inherent depth and breadth to allow for additional probing and a variety of interpretations. Adrian Spence, Camerata Pacifica’s Artistic Director, takes it many steps further, confidently predicting that these preludes will be played 200 years hence. That’s an exceedingly optimistic statement, one I’m not ready to embrace. That said, Mr. Spence provided some justification for his bold prediction during a follow-up conversation: the repertoire for similar solo viola collections isn’t that deep, and Ms. Auerbach’s preludes offer new music that is challenging yet still relatively accessible, with enough flexibility in presentation and style to make them appealing to other violists today and potentially further into the future. You want 45-minutes of music? Sure. You need a handful of short works to mix into a recital? You’ve got it. Maybe one or two contrasting works to wow judges for an audition? Here you go. I’m not sure if this is enough to enshrine it into the viola canon by the Year 2218, but it will be fun to see how things progress in the meantime. After intermission, Paul Huang (violin), Ani Aznavoorian (cello), and Warren Jones (piano), gave a thrilling account of Schubert’s B-flat Piano Trio. The four-movement work completed in the last year of the composer’s tragically short life shows a master in full command of his skills. Everything you’d want and expect from his music is here in abundance: captivating melodies, clever thematic development, and lyricism aplenty. Moreover, this is consistently joyous, cheerful music. If by chance one needed a foil to Ms. Auerbach’s dark preludes, this was it. Smiles filled Zipper Hall throughout the 45-minute piece. The three musicians offered a confident, ebullient performance. They passed melodies seamlessly between themselves, matching color and phrasing with apparent ease, demonstrating virtuosity both as individuals and as an ensemble. The audience responded with a warm and enthusiastic ovation. As is typical with Camerata Pacifica programs, the same two works were also presented in three other Southern California venues during the same week: at the Music Academy of the West in Santa Barbara, the Museum of Ventura County in Ventura, and The Huntington Library in San Marino. The listing of Ms. Auerbach’s work in the original program was “24 Preludes for Viola & Piano,” but the insert listed it as “24 Preludes for Viola and Piano (Wanderer)” [emphasis mine]. 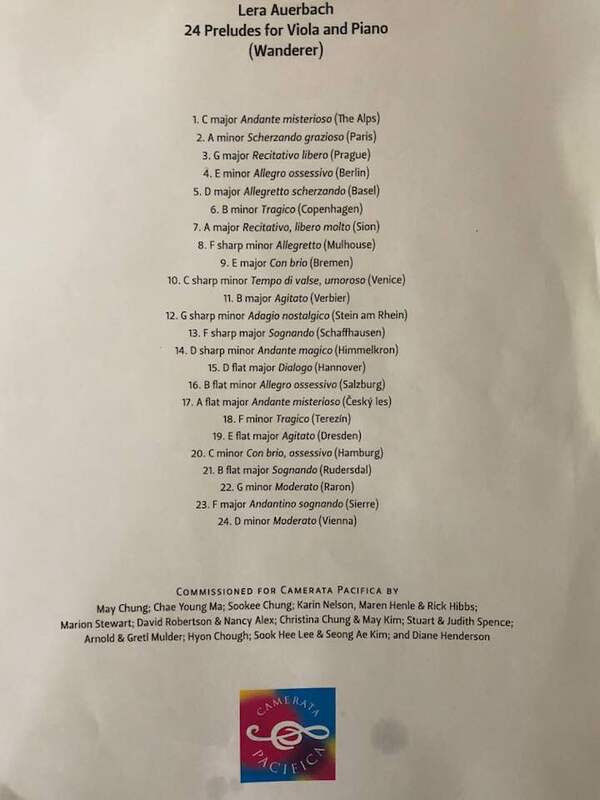 Additionally, the composer herself wrote the title as “24 Preludes for Viola and Piano (“Wanderer”)” on her own public Facebook post about the work [note quotes in the parentheses which are missing from the version in the insert]. I’m going with her version. Camerata Pacifica’s final four performances of the 2017-18 season will be May 10-15, in Downtown Los Angeles, Santa Barbara, Ventura, and San Marino. The program features Schoenberg’s arrangements of works by Debussy and Mahler, plus music from Ravel, Satie, and Emma-Ruth Richards. Tags: Ani Aznavoorian, Camerata Pacifica, chamber music, Colburn School, Lera Auerbach, Paul Huang, Richard O'Neill, Warren Jones, Zipper Hall. Bookmark the permalink.